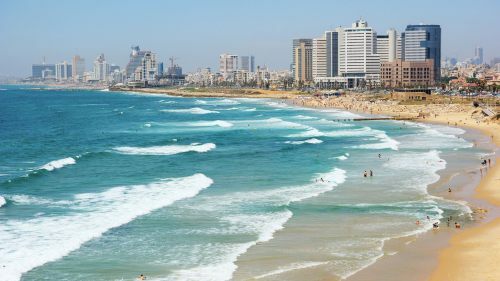 There are some third party booking sites showing flights from Toronto to Tel Aviv, Israel (TLV) for a pretty ridiculous price of $531 CAD roundtrip including taxes, using a combination of KLM and El Al. An important thing to note is that currently, only a few of the lower quality booking sites are showing this price. This can be a sign that a fare can't actually be ticketed for the displayed price. It may be a mistake fare that can't actually be booked. For longer trips, try mixing and matching the departure and return dates above. From Momondo.ca, click through to one of the third party booking sites showing this price. It appears to be Fare Geek, BuyMyTrip, and BudgetAir that are the third party booking sites currently showing this price. I don't have a huge amount of faith in any of these sites being able to ticket this price. You can also take the dates you find on Momondo, and try a search on FlightHub, who also seems to be showing this price. Update #1 - Oct 21 @ 10:00AM EST - These are now showing up as being bookable on CheapoAir and RedTag. Try using the dates above. These booking sites are of higher quality, which is a good sign. It's still a little concerning that they're not showing up on Expedia or other major booking sites, and erroring out when trying on the KLM website directly. Update #2 - December 4, 2015 - These are back today, although for slightly more, ranging from $570 CAD to $630 CAD roundtrip including taxes. The third party sites showing them through Momondo.ca in the high $500s are of pretty low quality. CheapoAir and RedTag are showing them in the low $600s, and might be a better way to go, being higher quality sites. The following AirBNB links will lead you to some great deals on places to stay in Tel Aviv for under $99 CAD/night for 2 people. 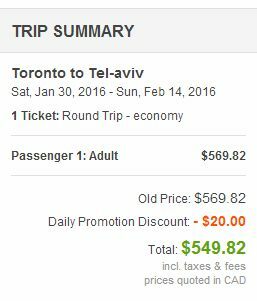 toronto, yyz, flight deals, klm, tel aviv, israel, tlv, the middle east and el al. 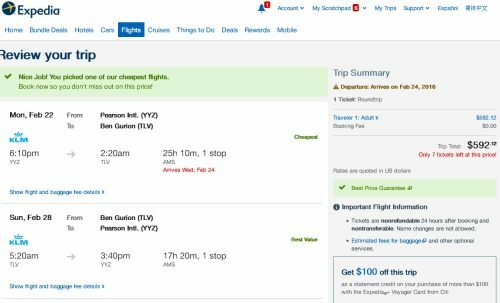 4 Responses to "Toronto to Tel Aviv, Israel - $531 CAD roundtrip including taxes"
I tried to call the online travel agencies that post $531 return flight and they don't answer the phone!!! This should be a BIG red flag for everyone! I also checked with every major online travel site including expedia, redtag, ELAL, KLM etc. and rates are around $900-$1,100. It sounded too good to be true so buyer beware!!! These prices are showing up on Expedia now for slightly more - $635. I booked the exact same flight on FlightHub for $540, and a friend booked through Orbitz for $431 (USD). Seems legitimate. Thank you! Any updates on if this deal is still available? Prices look to be in the $900s today. Have heard from a few people that booked it through CheapOAir.